Cutwork is so very elegant, and it looks much more difficult than it really is. 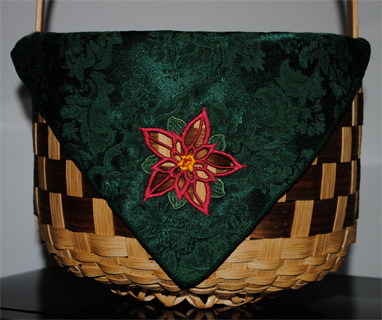 This project creates a holiday napkin or a gift basket liner or dinner roll cover. 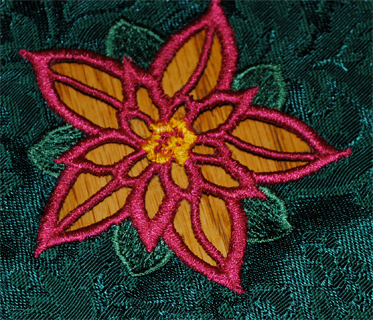 The poinsettia is part of the Christmas Cutwork Encore embroidery collection by Dakota Collectibles and it is available from Ann the Gran. I started with a 50/50 poly blend damask napkin that I bought in a two-pack on clearance after Christmas. (Of course, you can also make your own if you wish.) Hoop a heavy water-soluble stabilizer like Badgemaster. The design is stitch heavy and needs a substantial surface which Badgemaster delivers. I sprayed the back of the napkin corner with temporary spray adhesive and finger pressed it in place in the hoop. Be careful to keep the rest of the napkin outside of the stitch area. Use the same thread in the bobbin as that with which you are stitching. That way, no matter what side shows, the stitching will look beautiful. For the leaves, I selected a green slightly lighter than the napkin color so the leaf stitches wouldn't be lost against the green damask. The red was closer to the pink scale rather than a dark red or burgundy. The first stitch out is for fabric placement. 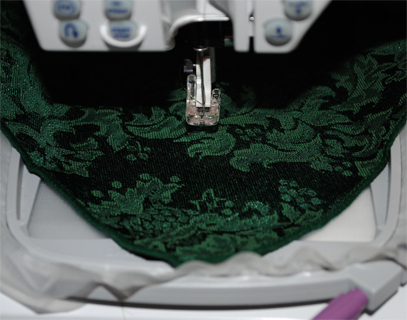 After the outline stitch, color sequence two, carefully trim the napkin from the inside of the stitching with applique scissors but do not cut through the stabilizer. Start by clipping a small hole. The applique scissors' wedge helps cut close to the stitching. Don't worry about fuzzies sticking to the stabilizer, it will wash off later. 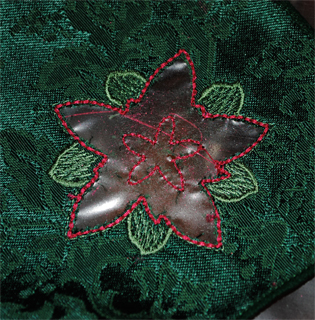 The final stitch sequence beautifully finishes edges and Richelieu bars in the middle of main petals. Remove from the hoop, trim excess stabilizer, and rinse in warm water to wash remaining stabilizer away. Blot with a towel and hang to dry. If you have never tried cutwork, Dakota Collectibles is a great place to start. Their designs have plenty of underlay stitches, and are very generous in the finishing satin stitches, so they look much more difficult to create than what they really are! Hi Debbie...I have not been confident enough to try cut work because I thought it would be too complicated. These pictures and explanation make it very clear. Thank you. Coincidently, I've recently noticed cutwork more and more to the degree that makes me WANT TO TRY IT! Thank you for the detailed photos. I KNOW you both could indeed create beautiful cutwork! Dakota Collectibles designs are great for beginners interested in cutwork because their finishing satin stitches are wider than most which offers a lot of forgiveness your first time out. Besides, you have several people here at Ann the Gran, like myself, who can offer any help you need! Give it a try and let me know how it turns out! All Tear-Away is Not Created Equal Where is an Expert when YOU need one?